Bioroids and Bombots: Can I Smoke? Smoke on the TS-era Battlefield. Can I Smoke? Smoke on the TS-era Battlefield. Below is an interesting table taken from “Smoke Operations Fm3-50 1990”. Note that the shorter wavelengths should actually be in microns rather than millimetres! Human visible spectrum in 0.38-0.7µm, infra-red is 0.75-1000µm. White Phosphorus (WP) ignites on contact with air and is relatively unstable in storage. It was used for smoke and as an incendiary and an anti-personnel weapon. WP burns at 5,000 degrees Fahrenheit (2,760ºC) and a by-product of the heat is that it obscures from the visual through to the far-infrared portions of the electromagnetic spectrum, making it effective against thermal imagers. Phosphorous smoke burns so hot that it tends to form a pillar of smoke (“pillaring”), which rises rapidly. This is undesirable for some screening applications where it is preferable that smoke spreads laterally. Use of WP can produce unintended fires. As an anti-personnel weapon it is considered to cause unnecessary suffering. Because of its toxic and incendiary effects the use of WP against targets where non-combatants are present is considered a violation of the “1980 Protocol on Incendiary Weapons”. By the TS-era WP munitions have been dropped from the inventory of most militaries. It may be encountered as a “terror weapon” used by some rogue factions. See High Tech p.172 for WP rules. Plasticized White Phosphorus (PWP) is a formulation of white phosphorus with some other agents to slow the burning, producing a more coherent smoke cloud with less pillaring. Red Phosphorus (RP) is not spontaneously flammable, requiring ignition to burn and make smoke. RP burns at a lower temperature of “only” 4,000 degrees Fahrenheit (2,200ºC) – which produces a more coherent smoke cloud with less pillaring. It is less incendiary than either WP or PWP, making it safer for use in smaller cartridges (for example, 40-millimeter grenades). Many self-defence smoke munitions for vehicles used WP or RP for its nearly instantaneous screening. RP can degrade in storage and produce toxic compounds. Hexachloroethane (HC/ HCE) is a mixture of HCE, zinc chloride and aluminium. When first produced, HC smoke is very hot but cools rapidly and has little tendency thereafter to rise. HC munitions tend to have a slower build up than phosphorus smokes. Phosphorous smoke produces phosphoric acid. HC smoke is acidic and may be carcinogenic. Respiratory protection is necessary if operating within such smokes. High Tech 4e p.171 defines such smoke as a mild irritant p.B439. Effects may be worse in confined spaces or high concentrations. Both HC and phosphorous munitions may cause unintentional fires. By the TS-era HC and phosphorous munitions have been replaced by more stable and less toxic “preformed obscuration granule” rounds (PFOG). PFOG compositions are known as “nanodust” or, less accurately but more commonly, “nanosmoke”. A PFOG round is essentially a dust bomb containing a mixture of different sized preformed particles. They are non-incendiary, the only pyrotechnic being a small bursting charge. Upon detonation a nanodust round instantly forms an opaque white cloud. Many PFOGs are hydrocopic, absorbing airborne water vapour to assume their optimal size. This allows more particles to be packed within a given volume. Very little humidity is needed for this and PFOG compositions are not affected by desert environments. The smallest of the PFOG particles scatter visible light. Larger particles scatter longer wavelengths through the infra-red and into the millimetric. Many rounds also include chaff fibres so have an obscuring effect against longer radar wavelengths too. An interesting property of PFOGs is that the larger particles settle more rapidly than the smaller. A cloud may become transparent to radar, and then infrared while still remaining opaque to visible light. This is seldom an actual problem in practice. Typically, a particle needs to be half to a third the size of the wavelength it is scattering. Settling velocity is proportional to the square of the particle’s diameter. A spherical 0.2 micron particle, suited to scattering visible light settles at 8mm/hr while a 3 micron IR-scattering particle settles at 1m/hr. These figures are for consistent, spherical particles. Many PFOGs are in actuality rod, disc or snowflake shapes that scatter more than one wavelength. Nanosmoke is considerably less toxic and less dangerous than HC and phosphorous. It is, however, very fine dust so breathing in large quantities may have some health effects. While PFOG are designed to be biologically inert, clearing inhaled particles from the lungs can take several days, with a temporary decrease in effective lung capacity. Soldiers without appropriate bio-mods wear respirators, smoke hoods or at least wrap a scarf over their faces. Like more conventional smokes, large quantities in confined spaces may displace available oxygen. The larger particles may form a residue on surfaces, leaving evidence that nanosmoke has been used. Like any dust, it may turn multi-coloured camouflaged into a monotone. Interestingly, the “type III IR obscurant” mentioned in the table is actually micropulverized brass (“brass smoke”). It is used in the M76 smoke grenade for armoured vehicle grenade launchers. It may be considered the ancestor of future PFOG munitions. 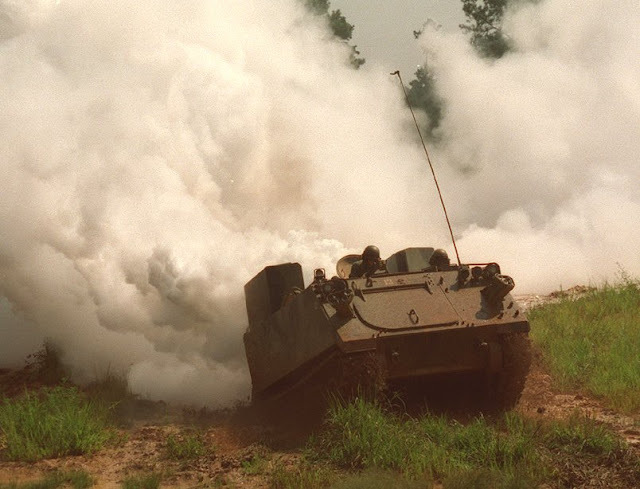 Nanosmoke is used for all screening or obscuration munitions, ranging from hand grenades to artillery. Of particular note is the Westforge Chuff, a 60mm nanosmoke rocket in a one use-launch tube. Airburst distance is set by rotating one of the simple quadrant sights on either side of the tube to the desired range. Originally designed for peacekeeping forces as a protection from snipers, it now sees a wider level of issue. Underwater vessels have their own equivalents of PFOG smoke screens designed to counter blue-green lasers and sonar. PFOGs can be used to create smoke that is only opaque at certain wavelengths. So called “soft smoke” only scatters visible light, permitting the operation of infrared and longer wavelength surveillance and targeting systems. Soft smoke is used when the deploying side holds a technological advantage. Used against a riot it can hinder the actions of a mob while allowing police and cybershells to operate at an advantage. As a psychological measure soft smoke riot munitions may produce coloured clouds of blood red, mustard yellow or bile green hues. Some “burning” smoke munitions are still in use. Coloured signalling smokes still use potassium chlorate, sugar and dye. New dye compositions allow for new colours, or non-toxic versions of colours used in the past. Florescent and luminescent colours might be possible! New insulating materials reduce the tendency for the exterior of the smoke bomb becoming dangerously hot. Containing the heat increases the tendency of the coloured smoke to pillar, which is not a disadvantage in a signalling munition. Bucket or barrel-sized white smoke chlorate bombs are used to produce large smoke clouds or supplement the use of fog-oil generators. An interesting TS innovation is coloured additives for rocket fuels. A short distance after launch a rocket begins to produce a coloured smoke trail. The warhead of such a marker rocket contains smoke composition of the same colour. In practice a marked location has a plume of smoke rising from it and a long skytrail of smoke pointing to it. A distress rocket can be fired into the air with a stream of smoke pointing back to the launcher. Wind, and other factors may affect this, of course. Smoke is considered to be a vital part of military operations. Most brigades have at least a platoon of smoke troops. In some armies these are engineers, in others they are chemical troops. Such units may also serve a decontamination or hazmat role. Typically a smoke platoon has several large smoke generators each mounted on a truck or light tracked vehicle. These generators use “fog-oil” to produce a cloud of smoke more than a kilometer long and can run for hours at a time. 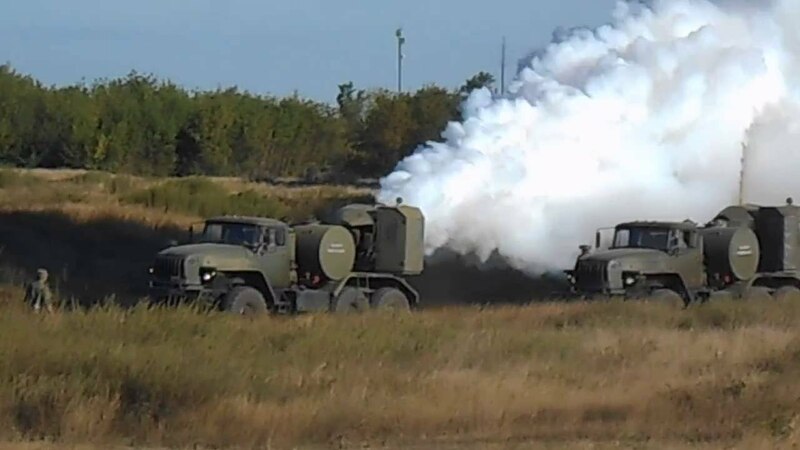 As part of an exercise in 2016 Russian smoke units made a cloud that covered the whole city of Severomorsk. TS-era smoke generators may seed a fog-oil cloud with PFOGs to increase its spectral opacity. Another TS-era innovation is to build smoke generators into large UAVs. These are known as “dusters” or “streamers” and like a crop duster they fly at low level laying a dense smoke screen in their wake. Usefully, such fliers can lay a smokescreen over enemy territory or over large bodies of water, perhaps concealing the approach of fast attack boats. The smoke grenade rules given in High Tech are a little too simplistic. Both an AN-M18 (HC smoke) and a coloured M18 (chlorate/sugar) produce a 7-yard radius cloud. It would be more likely that the coloured smoke would be a less effective obscurant. PFOG nanosmoke grenades can be treated as either Prismatic or Hot Prism smoke (TS 3e p.159), depending on chaff additives. Unlike chlorate or HC smokes, cloud build up would be nearly instantaneous. Smoke is going to be a common feature of TS combat, particularly when laser weapons are deployed. Fog-oil or PFOG clouds may hang around for extended periods, reducing the visibility even when the fighting has finished.